This electorate was named after Edward Grayndler (1867-1943), a member of the New South Wales Legislative Council (1921-1934 and 1936-1943). He was also General Secretary of the Australian Workers’ Union from 1912 to 1941. Location: Grayndler is located in the metropolitan inner west of Sydney. Bound by the Parramatta River in the north and the Sydenham Bankstown Railway line and the Goods Railway line in the south. To the east follows the Leichhardt Municipal Council boundary to Parramatta Road, along Kingston Road, Main Suburban Railway line and part of the Marrickville Council boundary. In the west follows Canterbury Road, Prospect Road, Liverpool Road, Frederick Street, Parramatta Road, Iron Cove Creek then along the western bank of Iron Cove. The main suburbs include Annandale, Balmain, Birchgrove, Canterbury (part), Dulwich Hill (part), Enmore, Haberfield, Hurlstone Park (part), Marickville (part), Rozelle, Stanmore, St. Peters, Summer Hill, Sydneham. 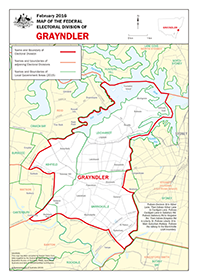 State electorates: State electorates within Grayndler include parts of the New South Wales Legislative Assembly electorates of Canterbury, Heffron, Summer Hill, Newtown, Balmain and Strathfield.